Because you're never too young to think about looking good while keeping safe, UVEX Sports, an innovator in eyewear and helmets for amateur and professional athletes, introduces the new Uvision bike helmet for young riders. This lightweight and comfortable German designed and engineered inmold helmet provides an incredible fit thanks to UVEX's new 3D Individual Adapting System (IAS) and protects the head from damaging sunlight through a new shaded ventilation system. UVEX's proprietary IAS has always ensured a perfect fit around the head, and now the fit can be adjusted for the height of a rider's head as well - a bonus on a growing child. As before, the IAS knob at the back of the helmet allows the helmet's head circumference to be adjusted freely with one hand and with fine accuracy. Now, however, two rear fastening elements on the IAS ring allow the halo's seven-point adjustment frame to be fine-tuned vertically, ensuring a more perfect fit for every rider on every ride. The Uvision features 17 ventilation openings, because kids get hot, too. And the all new lamella ventilation system at the forehead and back of the head prevents direct sunlight from entering the helmet and thus burning the child's sensitive skin without affecting air circulation. This ventilation system is similar to UVEX's proven air channel venting system used in the ski helmet line. Pretty cool benefit. Another safety feature of this high performance helmet is in the paint. The light colors reflect in bright light much like a signal to provide more visibility. 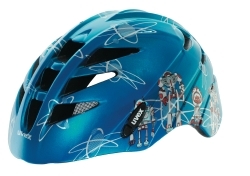 As with UVEX's adult helmets, Uvision's outer shell is the high-tech, unbreakable Makrolon produced by Bayer; the monomatic chinstrap has a ratchet closure for quick adjustments of the strap, even while riding; and Bug Stop mesh covers the front vents to keep bugs off the head, because while kids typically like bugs, they probably don't want them on their heads. The Uvision fits youth size 52-57 cm and weighs 250 g. Available in red/white/blue, purple/pink/white, pink manga graphic and blue robots graphic for a suggested retail price of $50. For more information about UVEX helmets, to place an order or to find a retailer near you, visit www.uvexsports.com or call toll-free 1-888-616-UVEX.